To add a managed property into Broker Brain, add a new property following the instructions outlined here, being sure to set the property Asset Type field to Managed. Using this asset type removes some of the unnecesary REO tabs from your Main sub tab, and adds a new Lease tab, on which you can manage tenants, leases, income, and expenses. Using the Managed asset type also impacts your pricing within Broker Brain, as managed properties fall under a different pricing structure than other property types. Note: If the property was previously available for sale and there were offers made, there will be an Offers sub tab shown on the left side of the screen for historical purposes. If no offers have been made on the property, the Offers tab will not be seen. Once the property has been added, your Main tab will look similar to the one shown below (you may have to refresh your screen to see these changes). 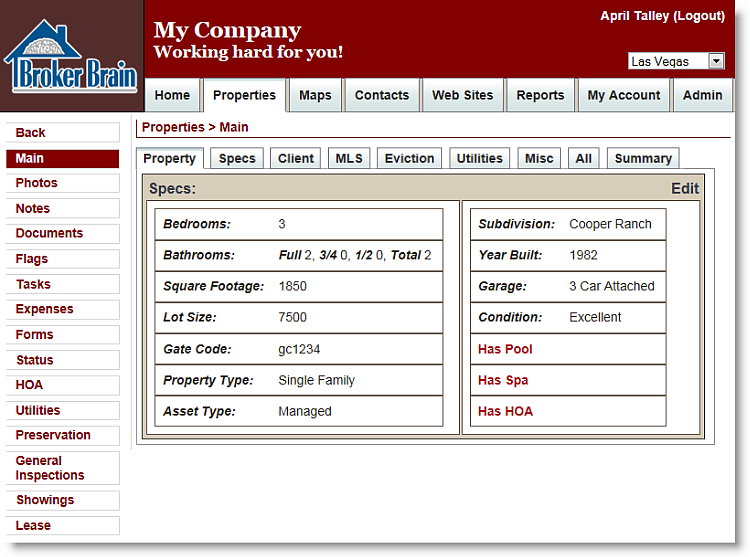 Fewer sub tabs will display at right than those shown on properties of other asset types. The sub tabs at left will also change.